Within days of Parliament clearing the Insurance Bill, Insurance Australia Group has decided to increase its stake in State Bank of India's general insurance arm from 26 per cent to 49 per cent. This is the second foreign insurer to announce raising its stake in the Indian venture from 26 per cent to 49 per cent, the maximum permissible foreign participation in the Indian joint venture. SBI General, a 74:26 joint venture between SBI and Insurance Australia Group of Australia, began its operation in 2010. The Executive Committee of the Central Board 'has on March 25, 2015 decided to initiate the necessary action as per JV agreement for dilution of SBI's stake in SBI General Insurance from 76 per cent to 51 per cent. . .
'. . . with corresponding increase of stake of IAG from 26 per cent to 49 per cent, including appointment of a valuer to facilitate valuation and price discover," the country's largest bank said in a statement. Earlier this month, Parliament had passed the Insurance Laws (Amendment) Bill, 2015 which seeks to increase foreign investment in private sector companies to 49 per cent from existing 26 per cent, among other things. In January, UK's Bupa Insurance had said that it will raise stake in its Indian health insurance venture, Max Bupa, to 49 per cent from the current 26 per cent, becoming the first foreign company to announce a hike in shareholding, following amendments to insurance laws. Max Bupa, a standalone private health insurer, is a joint venture between Max India (with 74 per cent stake) and UK-based global healthcare group Bupa (26 per cent). This company also commenced its operations in 2010. Many other companies, including Bharti, Reliance, Max India have expressed intent of diluting stakes in their insurance venture. Besides, many bank-led insurance joint ventures would lower their stake in companies so that they can get capital for expanding their core business of banking. 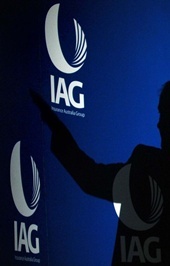 It is to be noted that IAG's proposal to increase stake comes in the backdrop of capital requirement of the company. "There will be a substantial capital requirement by next fiscal", SBI General Insurance Deputy chief executive officer Steve Hollow had said. The company pegs a total premium of Rs 1,600 crore (Rs 16 billion) by March 2015 as compared to Rs 1,200 crore (Rs 12 billion) premium registered last year.